Hi Sarah! 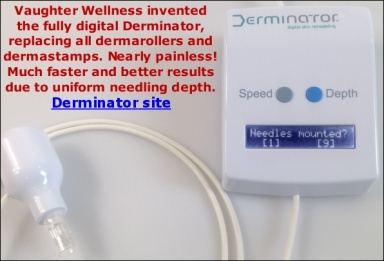 Your website is by far the best and most interesting information I have found on Dermarolling. Thank you for your care and detail. I ordered a 1.5 Dermastamp for my cheeks, a .5 Dermaroller for in between times, and a 1.5 Dermaroller. From the info I have read I seem to have ordered correctly. I also got the single needles , vit c, and the Infadolan. I have hyper pigmentation all over and light rolling scars. I look good in certain light and then when the wrong light hits my face, I can see all of the indents. My nose is my biggest concern. I have read your posts about treating the nose, and I am worried I will make my pockmark on my nose worse. It is pretty deep, and again in the wrong light, it looks like a hole. So sad! Should I even attempt the single needles or go to a professional to get it fixed somehow? Thank you. If you have hyperpigmentation, use your 0.5 mm dermaroller to enhance penetration of hydroquinone. Apply hydroquinone right after rolling. Do not touch your nose until you become very experiences with needling and stamping. First try to improve the scars that are not on your nose. Going to a professional concerning your nose is a good idea but I am not sure he/she will be able to help you because using laser for scars on the nose is also tricky. Have a consultation with a surgeon and you will see. BTW, everyone can be made to look bad under a certain lighting.. Thank you for getting back to me! I didn't see hydroquinone on your website. Should I look for a specific kind? Also, what do you think about using natural jojoba oil on the skin after to keep moist. Doesn't seem to break me out because it's light. I don't get really bad breakouts, but more so clogged pores. I did order the Infadolan, but I know it's greasy. I just want to keep my skin hydrated. I ordered a not so great roller a month ago with a stamp and did one treatment with both. I have noticed a subtle difference in the plumping of my scars already. After extensive research, I realized I bought too soon and don't use the old ones anymore. When it comes to my face, I would prefer to use the best!=) Thank you for your time. I know you must be busy! We do not sell hydroquinone but percentages up to 2% are for sale OTC. You can search our forum for hydroquinone to get more info. http://forums.owndoc.com/dermarolling-microneedling/oil-cleansing-method-to-get-rid-of-blackheads/Oils are good moisturizers and are suitable for dermarolling aftercare.